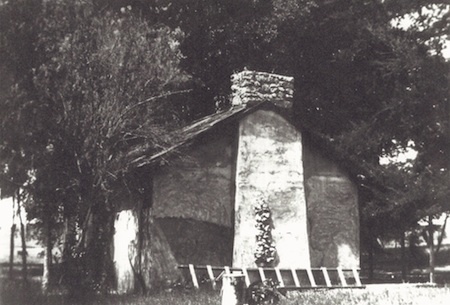 This one-room adobe structure, measuring 16 by 20 feet, served for many years as an office and court for Bear Valley Judicial District. Presiding over legal matters was Justice of the Peace S.T. Allen. The building was constructed in 1882 by the family of Jacob Reed who built most of the adobe homes in Valley Center from 1870 into the early 1900s. Jacob, his wife Martha, and several of their nine children made the adobe brocks. The Reed family homesteaded the 160-acre parcel on which the building stands. The property was later sold to farmer John Moore, then to S.T. Allen. During its years as a courthouse, the adobe building served residents from a vast portion of northern San Diego County. The nearest justice was 45 miles away in downtown San Diego, a day’s trip in the early part of the 20th century. During his tenure as a judge, Allen took special delight in performing marriage ceremonies, and couples from miles around made the trek to his tiny courtroom to exchange vows. He became known as “the marrying judge” and his little rural courtroom took on the nickname, “the Gretna Green of Valley Center”. The reference to Gretna Green was to a border town in Southern Scotland where eloping couples could marry in a hurry because of lenient marriage laws. By the 1930s, the adobe courthouse and surrounding property was bought by entertainment lawyer Martin Gang and became part of a successful farm where Gang and his wife raised four children. The Gang property was acquired in 1974 by the local school district and the historic adobe courtroom became part of a complex known as the Martin Gang Agricultural Learning Center. A school district caretaker resides in the building.